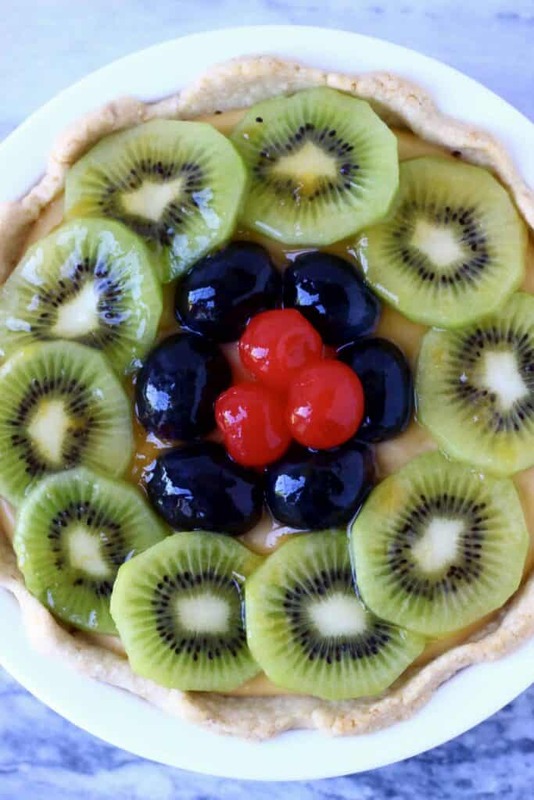 This Gluten-Free Vegan Fruit Tart is crisp and flaky, filled with creamy custard and covered in a shiny glaze! 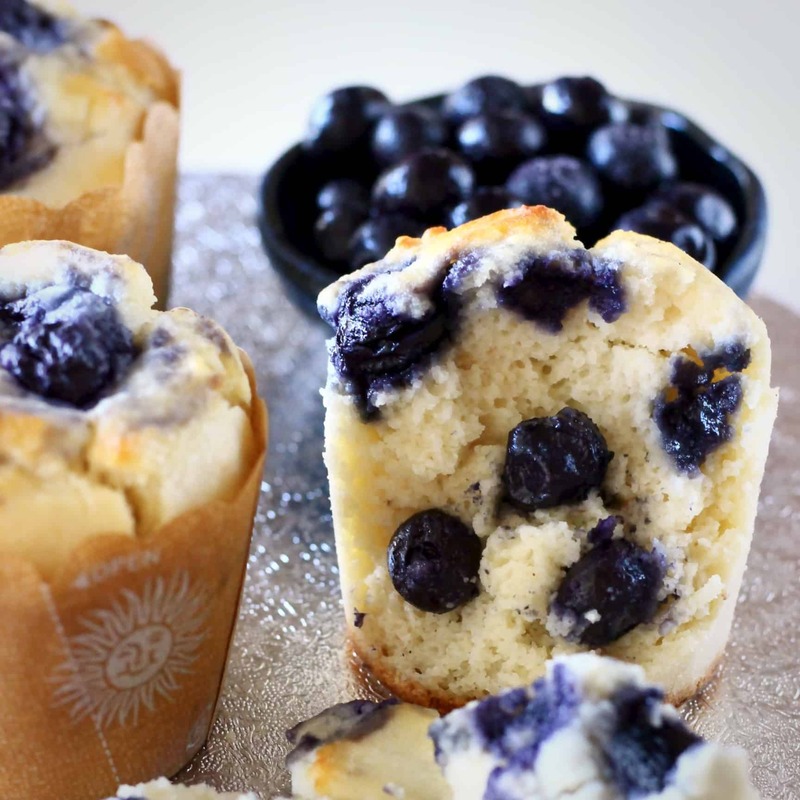 It’s the perfect easy yet impressive summery dessert. 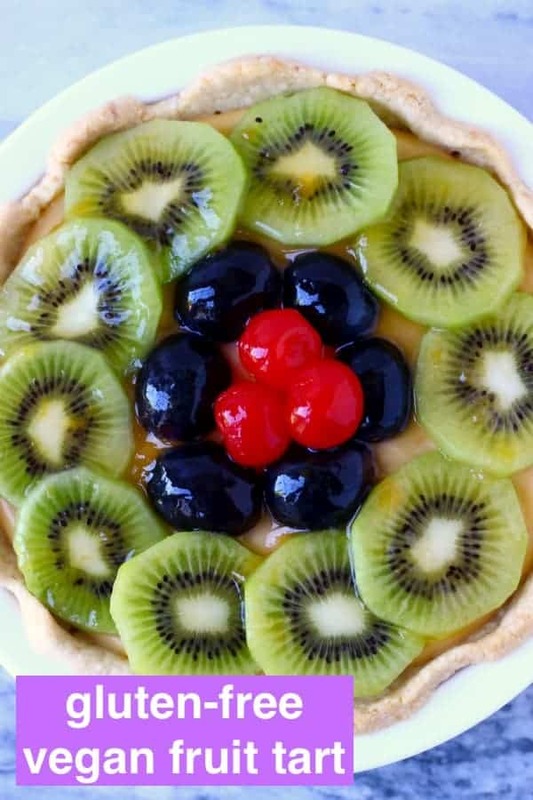 I used to love fruit tarts – what’s better than sweet, crispy, buttery shortcrust pastry filled with rich, creamy custard topped with sweet fruits and a dazzling glaze? Well, we’re in luck because I’ve managed to recreate this winning combination, but my version is also vegan, gluten-free and refined sugar free! 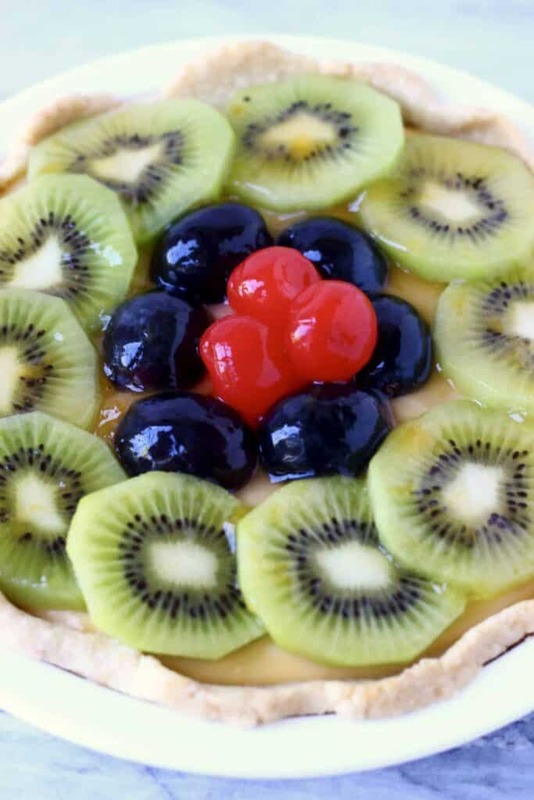 maple syrup for sweetness – I usually don’t add any sweetener to my pie crust recipe, but I think this fruit tart tastes better with a slightly sweet pastry. The maple syrup can be omitted, or substituted with any other sweetener. 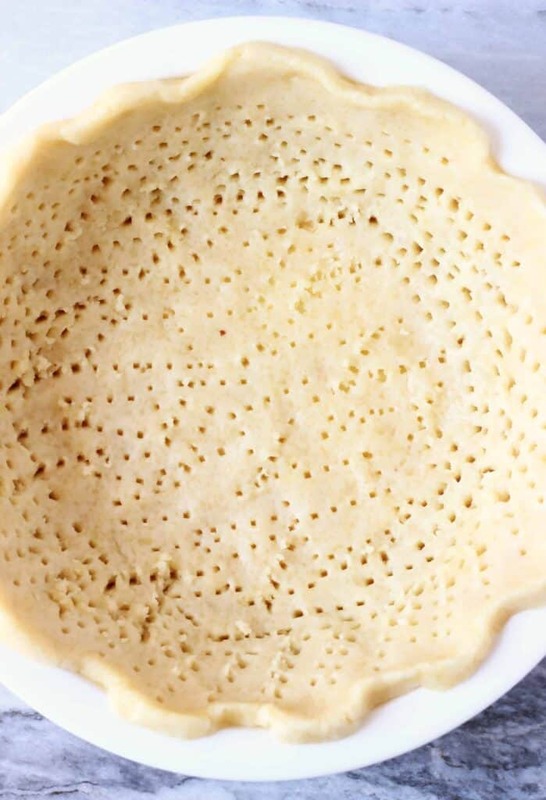 The crust can be pressed into the pie dish with your fingertips, which means it doesn’t require a floured surface or a rolling pin – the best baking recipes are the easiest! Tip: Make sure to use a fork to pierce the pie crust (don’t forget the sides!) to make sure it doesn’t puff up in the oven. You can alternatively use baking beans. 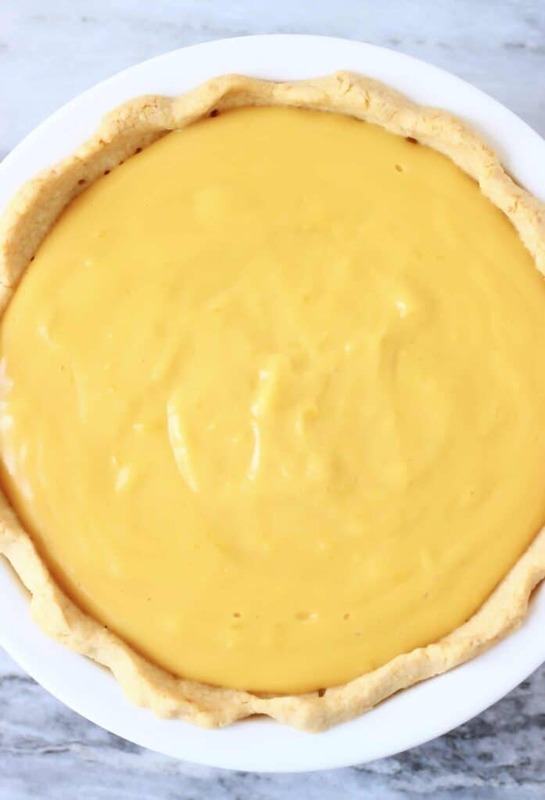 Once you’ve baked the pie crust until it’s perfectly crisp and golden brown, you can make the custard filling. custard powder to make my custard recipes. This is because it’s much easier, and it’s the best way to get a pretty yellow colour without adding turmeric, which can affect the taste – who wants a curry-flavoured dessert? Not me! 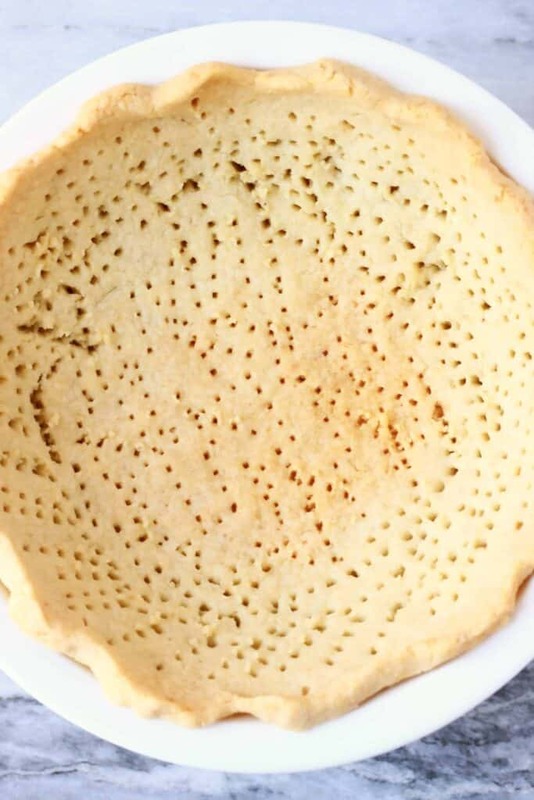 custard powder because it’s naturally vegan, gluten-free and sugar-free, and is made using just 4 simple ingredients! 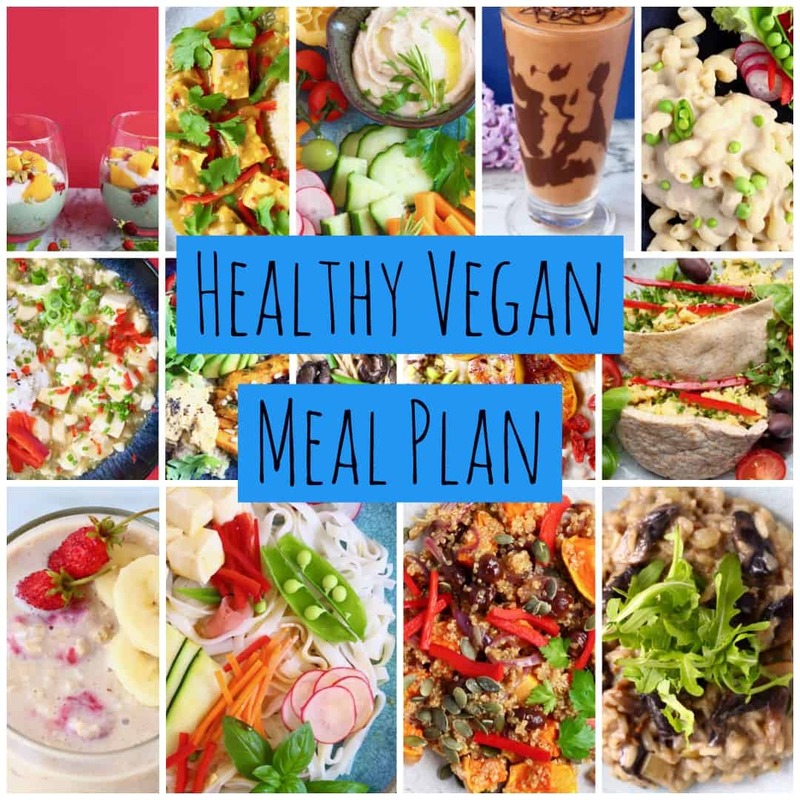 It’s super easy to use and tastes great made with plant-based milk – I recommend unsweetened cashew milk but other types also work! 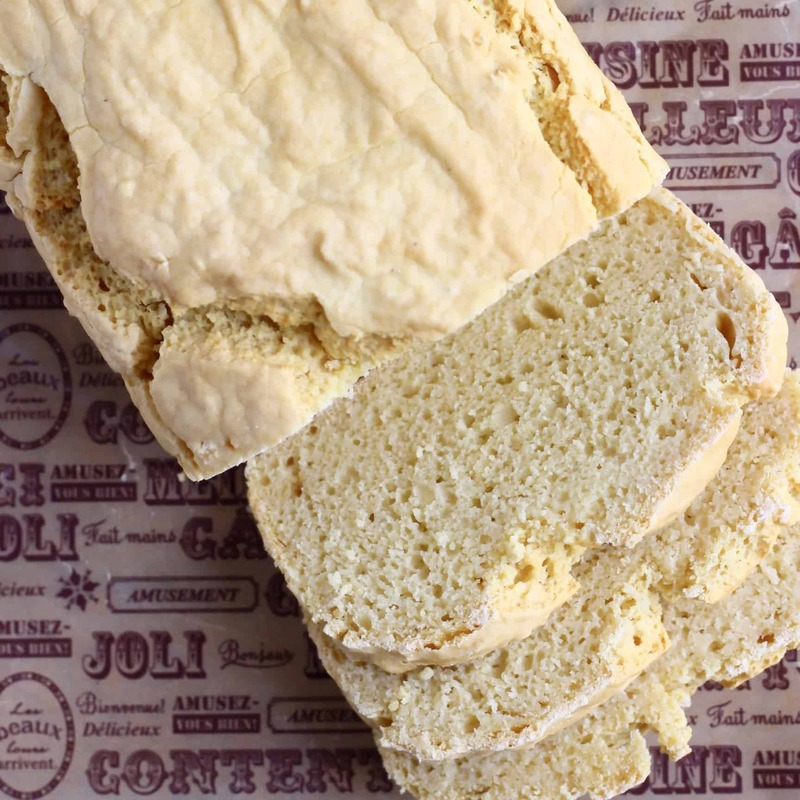 If you can’t get hold of a shop-bought custard powder, you can substitute it with the same amount cornflour (cornstarch), which will result in the same texture and flavour, though the colour will be considerably less yellow. Once you’ve made the custard and left it to set, you can get to work on the fun part – decorating it with fruit! 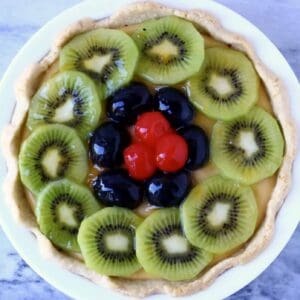 I used sliced kiwi, halved grapes and cherries, but you can use any type of fruit you like! You can leave it like this, but for a more classic fruit tart look, I like to spread over a shiny glaze. This can easily be made using apricot jam and some hot water. It’s super simple but looks impressive. apricot jam as it’s refined sugar free and naturally sweetened, and is made using just 4 simple ingredients! 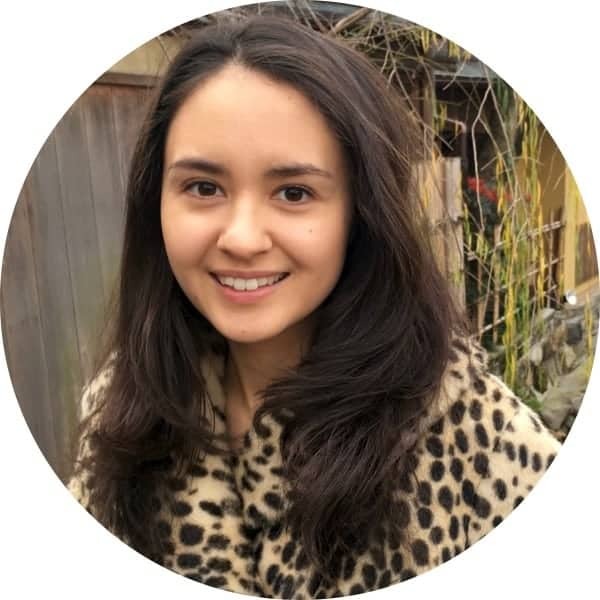 If you try out this recipe or anything else from my blog, I’d really love to hear any feedback! 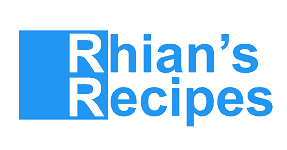 Please give it a rating, leave a comment, or tag a photo @rhiansrecipes #rhiansrecipes on Instagram! Thank you! 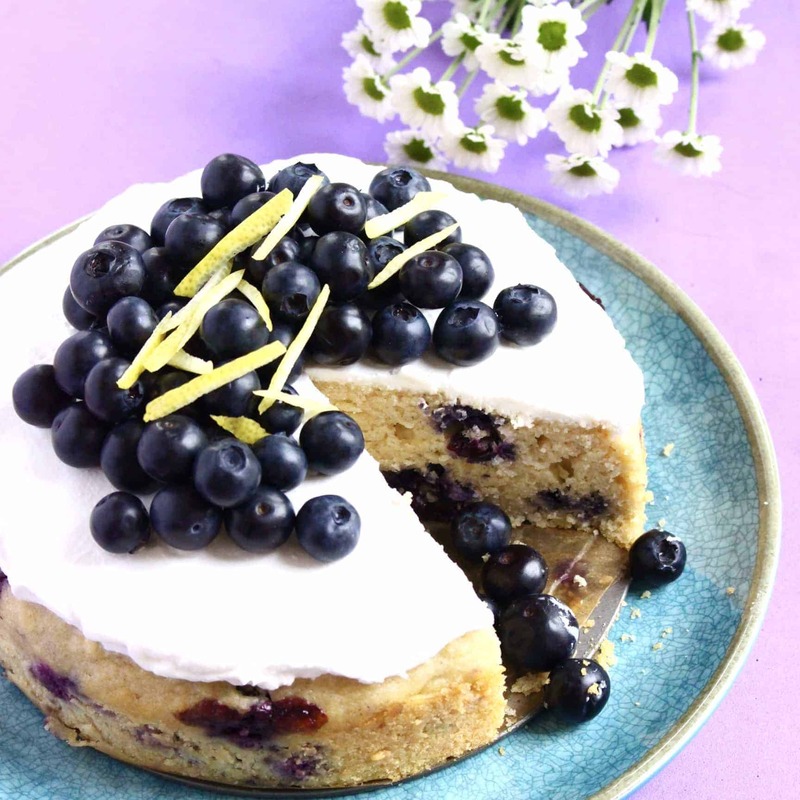 This Gluten-Free Vegan Fruit Tart is crisp and flaky, filled with creamy custard and covered in a shiny glaze! Combine all ingredients in a large bowl until it forms a firm dough - add the water a few tablespoons at a time so that you don’t add too much! 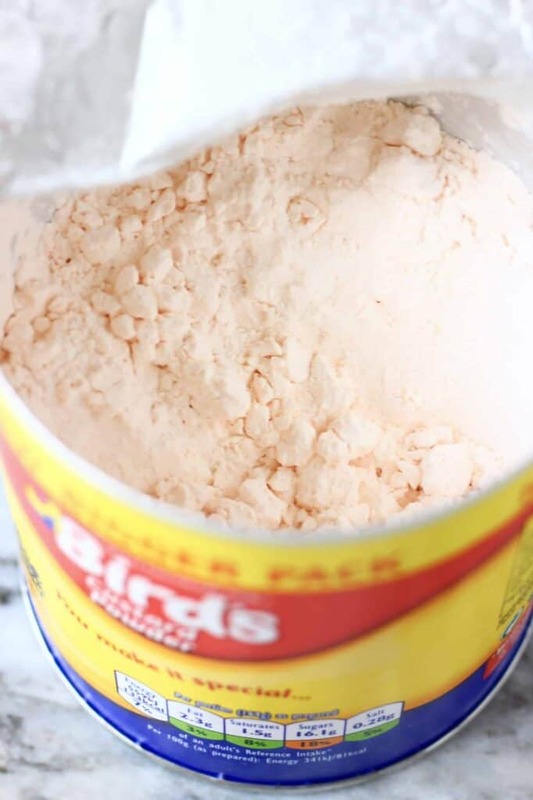 **If you can't get hold of a shop-bought custard powder, you can substitute it with the same amount cornflour (cornstarch), which will result in the same texture and flavour, though the colour will be considerably less yellow. This is way too long to bake ANY crust in the oven. Regular crust bakes around 15-18 min at 350. Glad I looked at it after 21 min as it is too browned on rim. Hi – so sorry about that. I’ve made loads of recipes that require this same pre-baked crust and it’s always taken at least 30 minutes, sometimes longer to turn crispy. I’m sorry about what happened for you – I’ll retest the recipe and see how it goes. Thank you so much for letting me know! Yes making it the day before is fine, it holds up well overnight!